Mon, Feb 11, 2019, 10:05 am SL Time, ColomboPage News Desk, Sri Lanka. Feb 11, Colombo: Two close associates of the underworld leader Makandure Madush have been arrested by the officers of the Tangalle Divisional Crime Investigation Unit yesterday at Sooriyaweva. 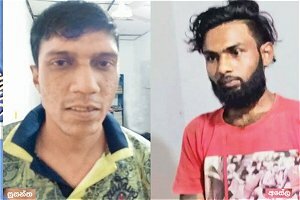 The two suspects were identified as 23 year old Hettiarachchige Asela Eranga alias Gesa, a resident of the Thelijjawila Thalgaswatta area in Matara and 38 year old Yakdeniye Nalaka Susantha Kumara aged, a resident of Meddawatta, Matara. At the time of arrest of Asela Eranga near the Navadagaswewa Bridge, officers found a T-56 firearm, 20 live bullets, 1 magazine and 1 gram of heroin and 190 milligrams of heroin in a bag belongs to the suspect. Investigations have revealed that the T56 weapon had been given to him by another organized criminal named Rotumba Amila. The officers found 2 grams and 480 milligrams of heroin in the possession of Nalaka Susantha Kumara who was arrested at the Sooriyaweva bus station. It was found that three warrants have been issued against him by the Matara Magistrate's Court. The two suspects have been arrested on information received by the Superintendent of Police in charge of the Tangalle Police Division, SP Laksiri Geethal. The seized T56 firearm and live ammunition are to be handed over to the Sooriyaweva Police for further investigations whie the suspects will ne produced before the Hambanthota Magistrate.